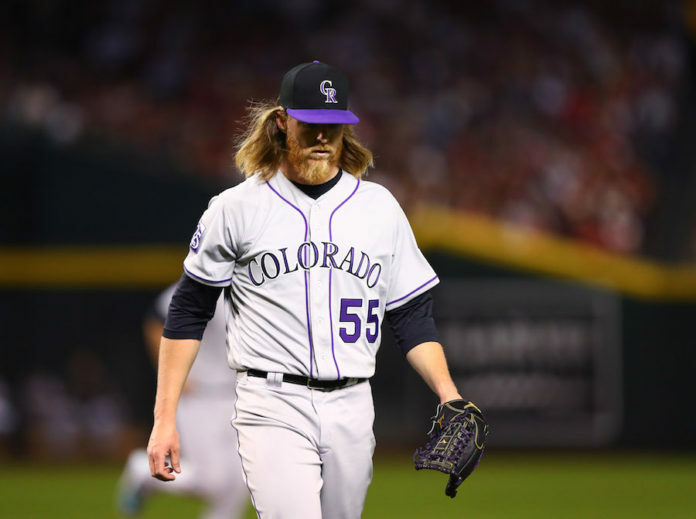 Jon Gray’s Opening Day start to the 2018 season was eerily similar to a pair of rough outings he suffered in 2017 — the National League Wild Card Game loss to the Diamondbacks and the Opening Day win against the Brewers. 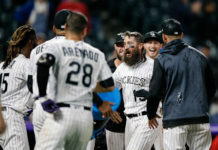 The final result was more resemblant of the meeting in Arizona that ended the Rockies’ season than the one in Milwaukee that began it, as the Diamondbacks defeated Colorado 8-2 to open 2018. Gray (0-1, 6.75 ERA) on Thursday became the eighth pitcher in Rockies history to make multiple Opening Day starts and the fifth to do so in back-to-back years. From the very start, though, shadows of his Wild Card loss last October haunted Gray as the right-hander again gave up three runs in the first inning. Gray allowed back-to-back singles to open the game for the second time in as many outings against the D-Backs. Instead of allowing a home run to Paul Goldschmidt, as he did in his first career postseason start, Gray walked the All-Star on a full count. Jake Lamb did the damage, though, doubling off the centerfield wall on the first pitch he saw. Goldschmidt later came around to score on an RBI groundout by Alex Avila. Gray finally escaped the inning by striking out Nick Ahmed. In last year’s Wild Card game, Arizona chased gray Gray in the second inning after allowing a one-out single followed by an RBI triple from Ketel Marte. Gray’s second inning this time around was much better, however. The 26-year-old got Arizona hitters to send three ground balls to two-time Gold Glove winner DJ LeMahieu for a 1-2-3 inning. Gray found himself in trouble again in the fourth, allowing back-to-back singles to Avila and Marte, but wrapped a pair of strikeouts around a Jarrod Dyson fly out to end the threat. Déjà vu resurfaced for Gray in the fifth inning, though; this time with shades of last year’s Opening Day game. He opened the fifth in Arizona by allowing a single and a walk — the same way his fifth started last year. Gray in 2017 pitched four-plus innings on Opening Day in Milwaukee, allowing five runs in the fifth without recording an out. 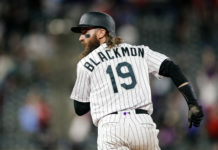 (The Rockies came back from down 5-4 to earn a 7-5 victory.) Like last year, Gray would not record an out before exiting in the fifth inning. He issued a second consecutive walk, this one to Goldschmidt, to load the bases and end his night. Gray’s final line in the 2017 opener was quite similar to his in 2018: Four-plus innings pitched and six hits allowed. His run total was just three this year, though, thanks to a lights-out display out of the bullpen in the fifth. Chris Rusin, one of the best relief pitchers in baseball in 2017, struck out Lamb for the first out in the fifth. Carlos Gonzalez, who did not rejoin the Rockies until three weeks into Spring Training due to a freezing cold free-agency market, stole Rusin an out when he grabbed a pop foul down the right-field line. Gonzalez battled a fan over the tarp to nab an out from Marte. Rusin proved he hasn’t missed a beat from last year, getting Avila to ground out to end the bases-loaded threat. Reigning (and three-time) Silver Slugger at third base Nolan Arenado used that boost from Rusin in the bottom half of the sixth inning, driving an 0-1 Patrick Corbin delivery over the left-field wall to bring the Rockies within one. The home run marked Arenado’s third on Opening Day, tying Gonzalez, Vinny Castilla and Troy Tulowitzki for the franchise record. It was also Arenado’s second hit of the night. LeMahieu put the Rockies on the board early with a one-out solo home run in the top of the first inning off Corbin (1-0, 3.18), the Diamondbacks’ starter. Arenado followed that with a scorching single to left, but strikeouts by Charlie Blackmon and Trevor Story to bookend those at-bats and another strikeout by Gonzalez to end the inning kept the damage at one run. LeMahieu had a chance to inflict more harm in the bottom of the fifth when he came to the plate with two on and one out, but grounded into an inning-ending 4-6-3 double-play. Rusin did not fare as well in the sixth inning, issuing a leadoff walk and then watching Dyson beat out a bunt down the first base line. After a pinch-hit sac fly by Chris Owings, David Peralta cued a ball to a pressing Arenado but the five-time Gold Glove third baseman could not get a bare-handed hold on the chopper and the Diamondbacks’ lead was back up to two. Lamb hurt the Rockies again, sending a bases-loaded, two-out bloop single into left field off Scott Oberg, who relieved Rusin. Lamb’s second hit of the night produced his third and fourth RBIs, stretching the Arizona lead to 6-2. The Diamondbacks didn’t hit a single ball hard against Rusin or Oberg, but still produced three runs in the inning. Ian Desmond led off the seventh with a base hit and Blackmon walked with one out, but LeMahieu grounded into an inning-ending double play for the second time in the game. Arizona tacked on two in the bottom of the seventh off Mike Dunn. Gonzalez and Gerardo Parra each failed to make diving catches in the inning, extending the damage. The Diamondbacks ended the night with 12 hits, including 5-for-17 with runners in scoring position. The Rockies, meanwhile, sent only one hitter to the plate with runners on base — LeMahieu, who twice grounded into double plays. Chris Iannetta, who started his career with the Rockies and spent last season with Arizona after stops in Anaheim and Seattle, was 3-for-4. Colorado had nine hits in the game. Tyler Anderson starts the second of the three-game series on Friday night against Robbie Ray. First pitch is scheduled for 7:40 p.m. MDT. Other Rockies pitchers to start back-to-back Opening Day games: Kevin Ritz (’96 & ’97), Darryl Kile (’98 & ’00), Mike Hampton (’01 & ’02) and Ubaldo Jimenez (’10 & ’11). Other Rockies pitchers to start multiple (non-consecutive) Opening Day games: Jason Jennings (’03 & ’06), Aaron Cook (’07 & ’09) and Jorge De La Rosa (’14 & ’16).